The OSCQuery Protocol is a new specification that allows live performance tools to automatically communicate their parameters for rapid setup and improvisation between performers. Along with native support within VDMX here at VIDVOX we have developed several useful utilities that make it possible for people to take advantage of these new capabilities with any software that already support MIDI and OSC receiving. In this introduction tutorial we’ll be looking at how to use the free (and open source!) 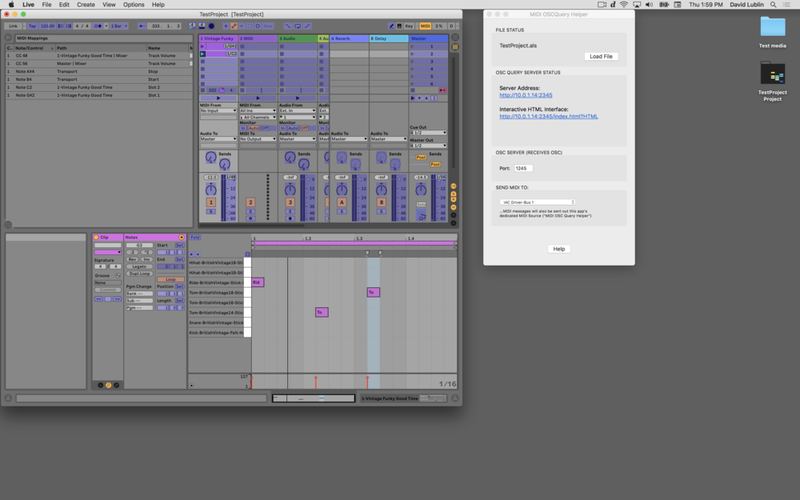 MIDI OSCQuery Helper utility to publish parameters from an Ableton Live project so that they can be accessed as browsable OSC parameters from other software such as VDMX. The MIDI OSCQuery Helper also includes its own built in Interactive HTML Interface which can be loaded in web browsers on desktops, laptops, smart phones and tablets to remotely control any published controls. 1. Within Ableton Live, create MIDI assignments to clip triggers, instrument and FX parameters and other controls as you normally would. Save the project. 2. In MIDI OSCQuery Helper, use the “Open…” option from the File menu and select your .als file. 3. Click the link for the “Interactive HTML Interface” to load the controls in a web browser, or use other software such as VDMX or the OSCQuery Browser to remotely control the Live setup. After completing this tutorial, you may want to see the related tutorials on using the OSCQuery Client plugin and using OSCQuery publishing in the Control Surface plugin. The OSCQuery Client and OSCQuery Browser in VDMX can be used to access remote parameters. The MIDI OSCQuery Helper can also load in JSON files that specifically describe arbitrary OSC -> MIDI mappings. The free OSCQuery Browser standalone tool can also be used to browse and access published parameters.